But, back to the food. I managed to take photos of each course despite the colleagues on my table thinking it was a little strange…. I said it was to show a foodie friend- that’s you!!! 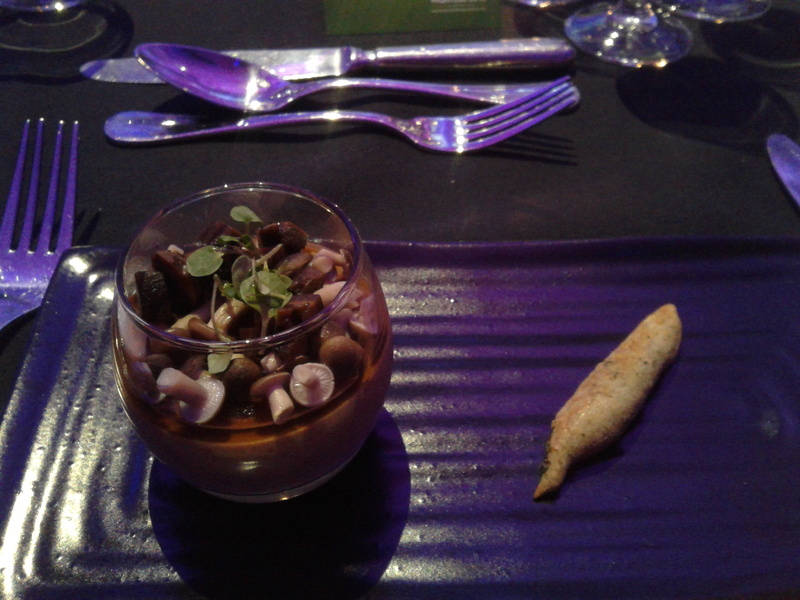 Starter was a mushroom trifle topped with a maderia jus, pickled walnuts and mini mushrooms. The little bread stick on the side is made of lava bread. It was good, although very rich. The trifle was more like a rich mushroom pate and the fruitiness of the jus on top worked really well. I couldn’t finish it all as it was so full flavoured, and I wanted to leave space for the 3 courses to come. Main course was lamb cooked in 2 ways. 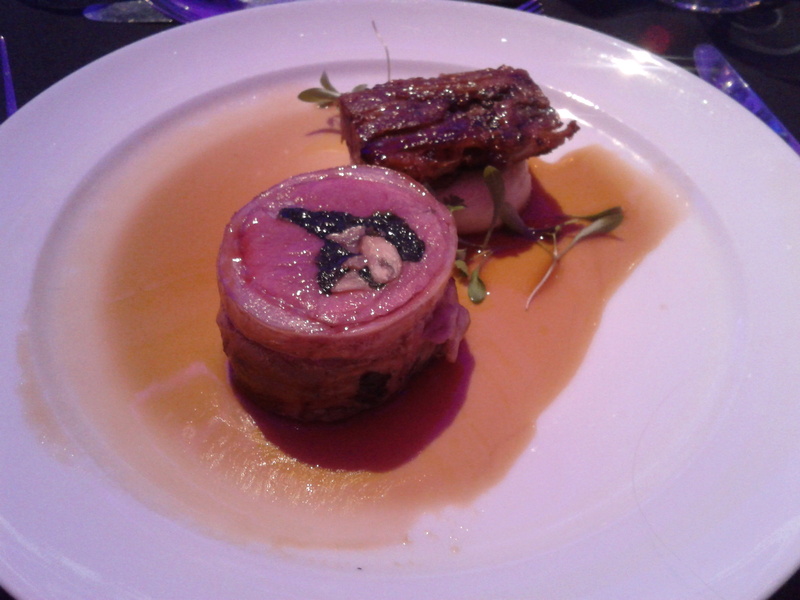 One piece of lamb was a stuffed saddle of lamb, the other being a slow roasted breast. The breast was sat on top of smoked potato mash- really lovely, and like nothing I had tasted before. The gravy was a reduction using pomegranate molasses, but it was quite weak as I would have liked to see more of the sweet/sour flavour of the molasses to shine through. One the side were some griddled leeks which complemented the meal very well. I’m not entirely sure I can accurately describe this creation- it was quite something. The plate is actually white but had been sprayed with chocolate! 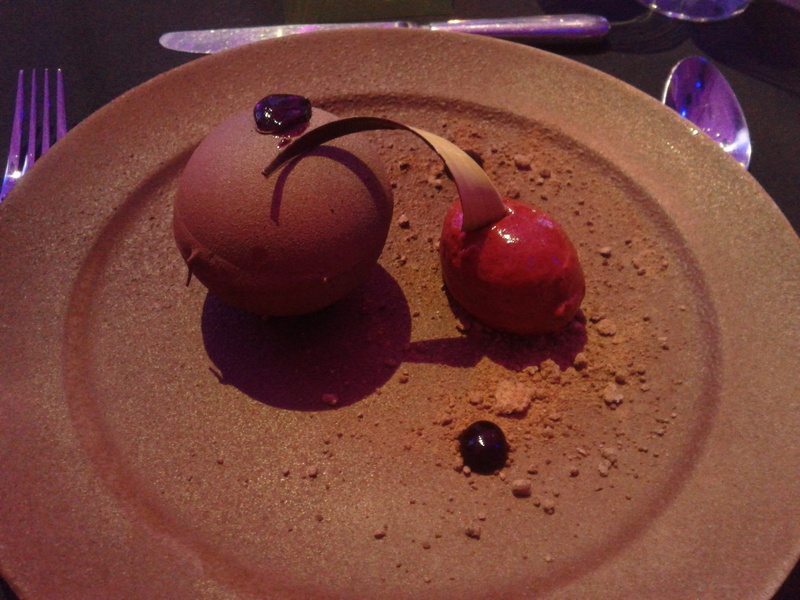 There is chocolate ‘soil’ on the plate with the blackcurrant sorbet, and this was absolutely gorgeous. The chocolate sphere was holding a chocolate mousse on a fennel compote. Quite amazing, very rich, and not something I could ever make. Lovely. 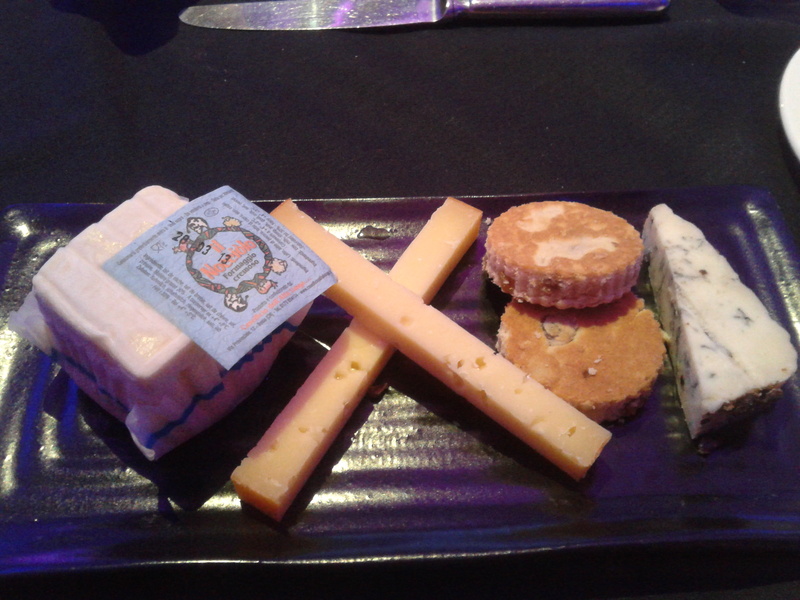 As of that wasn’t enough there was a cheese course! It was actually about 11pm by now and I wasn’t sure I could fit any more in…. The left hand cheese was very unusual. Italian, it was made from the milk of cows, goats and sheep. This made it very creamy, rich and yummy. The middle cheese was a gouda which was almost crunchy, and the blue on the right hand side was very strong and a good contrast. I didn’t eat the welsh cakes as I am not keen on them, but the rest of the table gobbled them down. I have come back about 3lb heavier I think! Good job it’s only once a year. It’s our weekend off so we are having a nice relaxing time. I did get up early and go to the gym though- although there was an ulterior motive as it meant I could get some lovely seeded sourdough bread from the farmers market and some cupcakes from the cute cupcake shop in Twickenham! 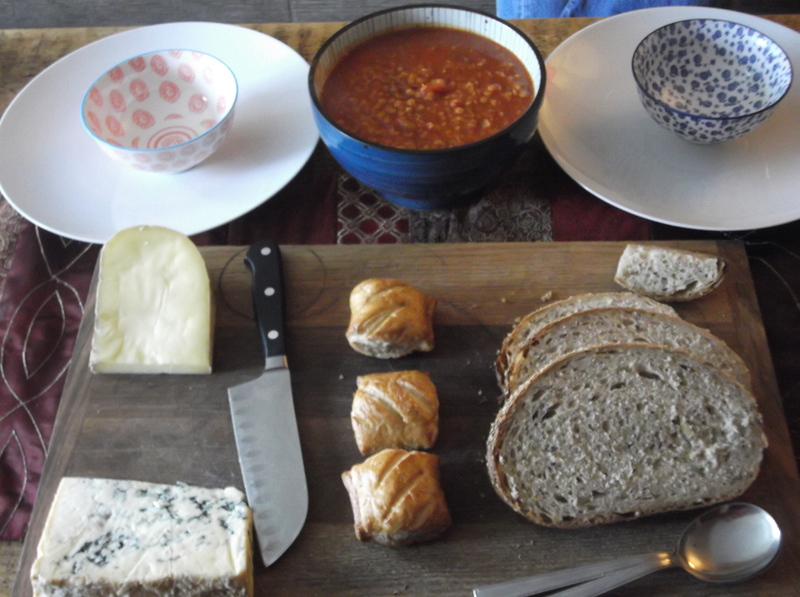 Lunch was a weekend off favourite- soup, bread and cheeses, and sometimes some sausage rolls for Colin. The bread and cheeses came from the Farmers Market- the sourdough from The Celtic Baker and the 2 cheeses from The Wyfe of Bath. The blue cheese in particular was delicious- a strong blue cheese with a smooth, creamy texture. I made the soup and have loads left over for lunches through the week. It’s a red lentil, tomato and cumin soup. I simply sauteed an onion and a clove of garlic in a little olive oil in a large saucepan. I then added red lentils and cumin, with a pinch of paprika and chilli powder and added 2 tins of tomatoes and a tin full of veggie stock. This was then simmered for about 40 mins until the lentils were soft and cooked. Really lovely and warming. The leftovers are more stew like and will be perfect for some wintry lunch in the week ahead. 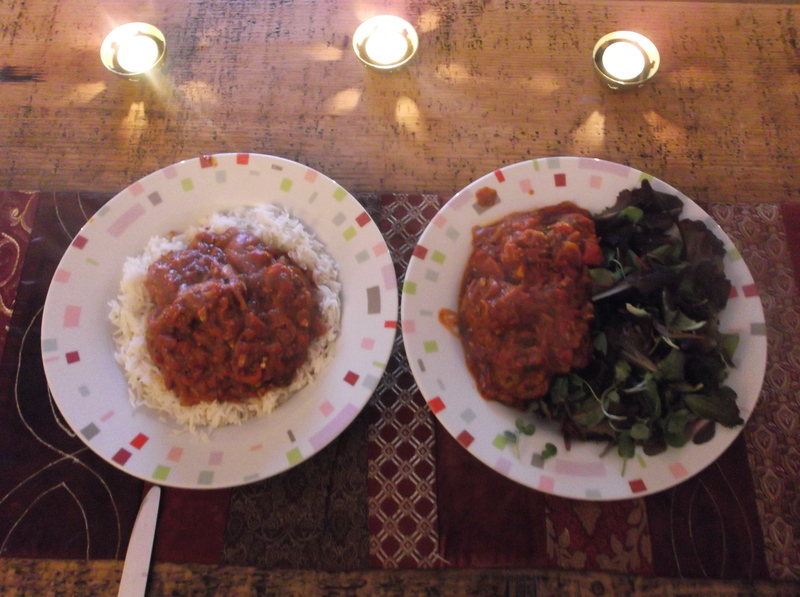 Being Saturday it must be curry night, and another Veggie Curry Night adventure. Working clockwise from top left we have lentil vadas (yes!!! 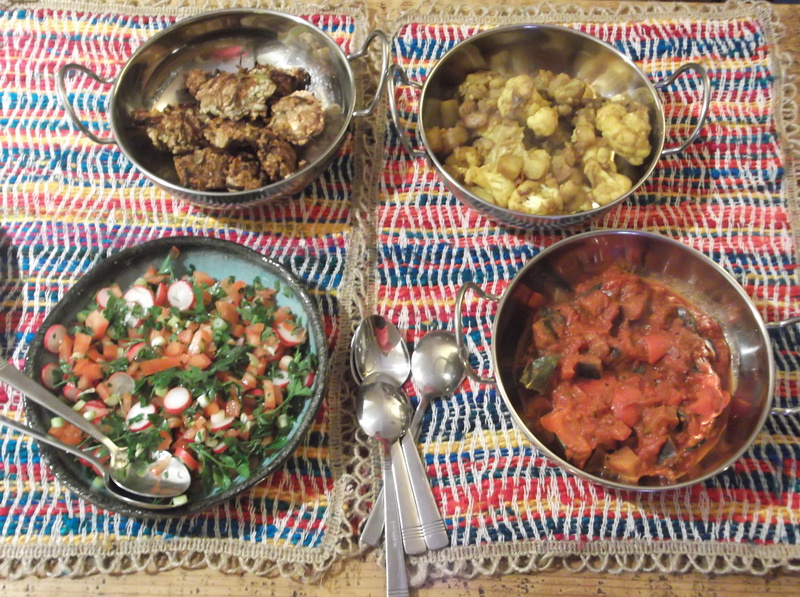 ), aloo gobhi, aubergine, red pepper and tomato curry and a radish, tomato and parsley salad. The lentil and cauliflower recipes were new whereas the aubergine and radish dishes were my own creation. All really good, but lets face it Lentil Vadas have the best name ever!!! The came from Feast Bazaar by Barry Vera. 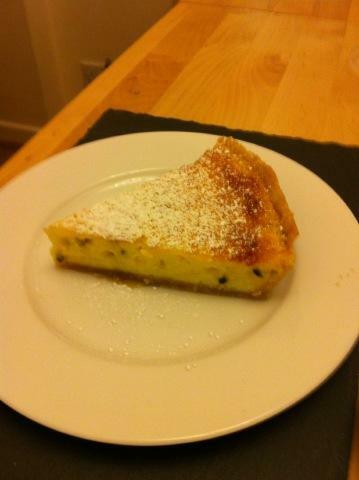 They really were worth the effort, Colin loved them, so here’s the recipe. soak the lentils for a couple of hours. I actually forgot about this and only soaked them for about 30 mins and it turned out fine. pop the drained lentils into a food processor and give it a couple of mins to break down into almost a paste. transfer to a bowl and add the onion, coriander, chilli, ginger, bicarb and salt. Mix well and leave to stand for 15 mins. heat some oil in a wok or saucepan. Add little spoonfuls of the mixture into the oil-you can shape into balls or strips or freeform! Fry for 5 mins, turning often, until browned all over and crispy. Drain on kitchen paper and eat. 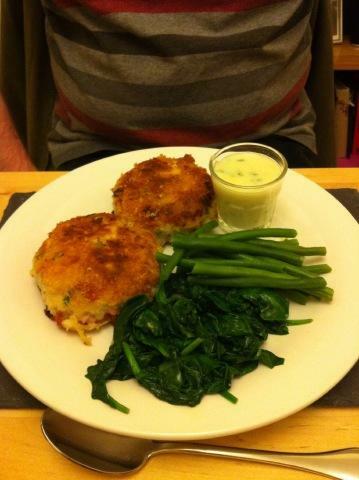 They were lovely- the outside bits of lentil and onion go all crispy and the inside have a great texture. Much better than an onion bhaji by far. Tomorrow I will make a pizza for lunch- being careful not to make it too sloppy….. And then I am off to my conference in Cardiff until Tuesday. I’ll update if I come across any yummy delights on the way- here’s hoping! Tonight’s dinner comes from a new addition to the Library- Jez Felwick’s The Bowler’s Meatball Cookbook. I had seen this book reviewed in several of this months food magazines and it is just up my street. The balls are not only meat- there are fish and veggie balls, as well as all the accompaniments and sauces. Highly recommended! Mine is on the right with all the salad! The meal was delicious- the balls juicy and the sauce spicy, really yummy. Here’s the recipe for the balls. I’ve slightly adapted it from the main to reduce the number of balls made. in a bowl whisk together the ricotta and egg. Add the meat, breadcrumbs, garlic, coriander, salt and chilli. Min with your hands until well combined. 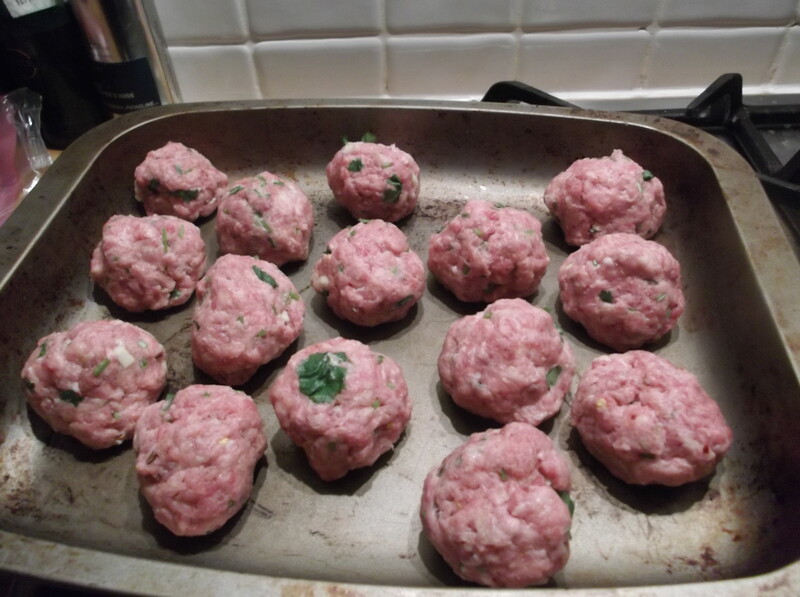 form the mixture into meatballs- whatever size you like. bake in the oven for 15 mins, turning half way through. meanwhile you will have been making your sauce- a spicy tomato sauce is good, or the red onion and tomato sauce from the book. add the balls to the sauce and simmer for 15 mins. There are many more recipes ear marked from this great addition to the library. Somewhat of a disaster dinner tonight- well maybe not that bad but not the yummy delight I was hoping for after a long day. I was supposed to be making a chicken traybake which I’ve made hundreds of times, for just the 2 of us and for other people, always successful and always tasty. However, tonight it was sloppy and looked crap so chicken was rescued and served with potato wedges and salad. Filled the tum but not with great happiness! No picture so I can forget all about it….